Payout Management allows configuring payout paid by buyers in their call campaigns or direct post lead campaigns. This board visualizes payout rules that created in the construction kit. This scheme helps you understand what payout will be paid by the campaign for the leads with specific criterias. Construction Kit enables the creation of complex and flexible payout settings with various Filter Rules, interacting with the help of And / Or statements. The list of fields in the dropdown varies according to a vertical selected. Use the Search field to find the field you need. 5. Enter a value to a field that appeared. It can have different formats according to previous selections. Payout rules work independently. In case of conflict between different payout rules (e.g. a lead is not from Offer 56 but at the same time this lead is from District of Columbia), a default Direct Bid value is used, configured in Campaign Settings. 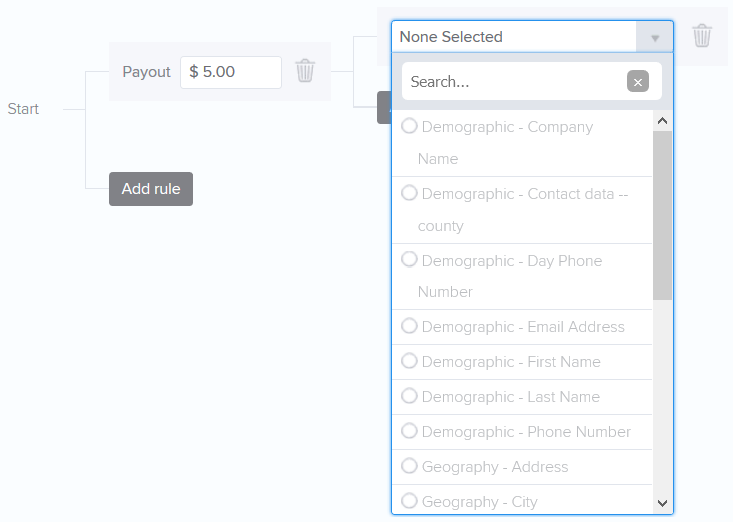 If buyer campaign receives the lead according to configurations in Source and Filter Management, but there is no payout rule for this lead, Direct Bid is used as well.